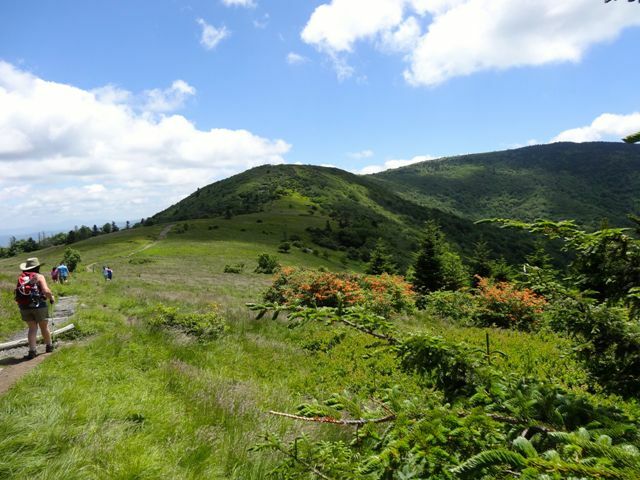 Eleven hikers met up on Monday morning to carpool up to the Roan. We were hiking by 11am from Carver’s Gap, North on the Appalachian Trail. The Catawba Rhododendron had a few blooms still here and there, but mostly gone. A few of them were found during the hike still in prime flower, but only a few. When we got over Round Bald and down into the first gap it was Flame On time with the Azaleas. Lots of shutters were clicking, both of the flowers and of the views. It was a gorgeous day on the high balds. We were delighted to find many of the Gray’s Lily in bloom along with the Tassel Rue , King Devil, and Ragwort. We made it up to over 6000 feet on Grassy Ridge before turning around to see what we missed on the return hike. The weather was turning warm by the time we descended back to the vehicles and after 6 miles, the hikers were getting hungry. So all agreed to stop by a Mexican restaurant near Asheville to wet our whistles and fill our bellies before making the trip home. But the memories of the sunny day with the wind flowing over the grassy balds with stunning flowers abounding brings a smile to the face and refreshes the spirit.